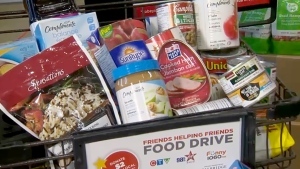 It all started 25 years ago when a CTV staff member came up with the idea of a spring station food drive to help the local food bank because she heard that donations that time of year were slow. 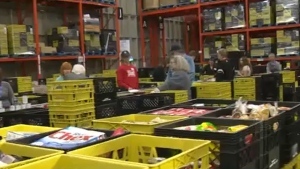 The Friends Helping Friends Food Drive was born and has become a vital part of the Calgary Food Bank’s fundraising efforts. 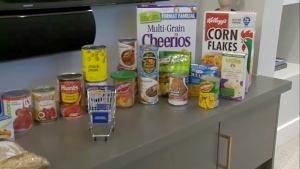 Since its inception, more than $2.8 million in food and cash donations has been raised. 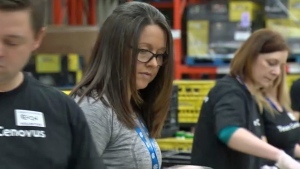 Now more than ever Calgarians are struggling with the economic downturn and we need your help. 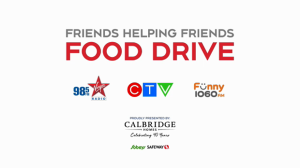 Proudly presented by Calbridge Homes, CTV Calgary, Virgin Radio, and Funny 1060AM are asking Calgarians to help the Calgary Food Bank this month by dropping off food donations at their local Safeway or Sobeys store as well as all Calbridge Homes Showhome locations. CTV Calgary personalities will be at the Sobeys store in Tuscany on Saturday, April 13th and at the South Trail Crossing Safeway Saturday on April 27th between 1pm and 3pm. They’ll be pitching in and meeting Calgarians as we celebrate our 25th year helping the Calgary Food Bank. Drop by for a photo and help us help our friends and neighbors. 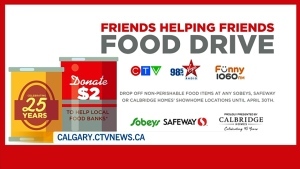 Food Bank volunteers will be onsite at all Calgary Safeway and Sobeys stores collecting cash donations on these dates as well from noon to 4pm. Click HERE to make a monetary donation online to the Calgary Food Bank. Thanks for supporting Friends Helping Friends!